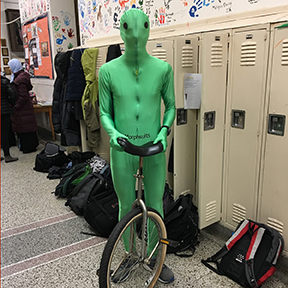 Every year, Uni High hosts a spirit week where students and faculty dress up according to daily themes. A spirit assembly wraps up the week. This year, along with changed events, music played over intercoms, and the addition of teacher jeopardy, advertisement failed to alert students sufficiently. Some students were not aware of the events taking place. Tori Kindratenko, the Executive President of StudCo, said the assembly bolsters school spirit. She explained that since Uni is such a small school, fun events like these can replace normal pep rallies. Additionally, the dress up days leading to the assembly hype up and prepare the students for Friday. However, StudCo reflects that they could have advertised better. The week before, four out five students interviewed said they did not know spirit week occurred in the upcoming week. “For next time we should advertise a lot more before the week so everyone is aware,” Executive Secretary Lawrence Taritsa wrote in his weekly StudCo minutes email. Typically, posters adorn the halls to announce the dress up themes, and StudCo sends volunteer spreadsheets a week or two in advance. This year, one email was sent out to notify the school. Last minute changes to the assembly and theme planning occurred only five days before the first day of spirit week. To boost enthusiasm, StudCo played music over our school’s new intercoms during passing periods. Each day a different class queued a playlist, with subbies and freshmen sharing Tuesday and other classes taking on different days. “I think the music was great because it really pumped up people,” said Romaisa Aamer, a sophomore. A new event, teacher jeopardy, successfully launched during Wednesday at lunch, with each class’ sponsor competing. The categories were: Words Starting with V, Memes, Uni High, Now That’s What I Call 2010’s Kidz Bop Version, and Animated Movies. Spectators filled the library to watch the junior class’ representatives, Kathy Rodems and Joel Beesley, win. StudCo also modified the spirit assembly that took place at the end of the day on Friday. The events of the assembly included: the obstacle course, half court shot, a pie eating contest, three-legged race, and the dance off. Parts of the obstacle course were changed, such as the addition of limbo and the replacement of sprinting down the gym with wheelbarrowing. This year, the tradition of class-wide tug of war ended. “The tug-of-war was good because the whole class could participate, whereas the other events are just one or two volunteers,” commented Aamer. With Monday off, students came back to discover the commencement of spirit week dress up days. Tuesday was PJ day, Wednesday was Character/Vine day, and Thursday was Twin/Dynamic Duo day. On Friday, each grade wore class colors, with subbies as white, freshmen as blue, sophomores as red, juniors as black, and seniors as purple. Dastgheib commented on the class colors. “I was kinda confused why we wore white, since our school colors are orange and blue,” he said. “I forgot the dress up days since we didn’t really do them at my old school,” admits Lee. Nonetheless, students still appreciate spirit week. “It relieves stress from students, since it’s a while until the next break,” commented sophomore Simon Orlie-Frost. “It’s just a fun week,” said Albert Lee, senior.